Since The Avett Brothers' Grammy Awards appearance earlier this year, the band has grown in popularity, attracting all types of fans to their version of "roots" music, or music developed in the United States. Band member Bob Crawford, who plays upright bass and electric bass, said the band's popularity has come from its years of touring and live performances. The Avett Brothers make their way to Sun Valley today, July 13, to play the Sun Valley Pavilion as part of the Sun Valley Center for the Arts summer concert series. The Sun Valley Pavilion seats are sold out but lawn seating is available for $25. The lawn seats have limited to no stage view. Tickets are available online at www.sunvalleycenter.org, by calling 726-9491 or at The Center in Ketchum. Gates will open at 6 p.m. and Jessica Lea Mayfield starts at 7 p.m. The Avett Brothers will start around 8 p.m. Those holding series tickets and pavilion tickets should use the West entrance to the Sun Valley Pavilion. Those with lawn tickets will enter from the northern edge of the lawn. Those with lawn tickets will not be admitted into the pavilion at any time. There will be no outside food, drink or picnics allowed on the lawn or in the pavilion for this show. "I love Idaho," Crawford said. "It's a beautiful place. I'm a big fan of the high desert." Crawford is from southern New Jersey and discovered Avett brothers Scott and Seth while in South Carolina. "They need someone who played upright bass," he said. "It was the three of us for six or seven years and then we added a cello. We slowly became electrified and added a full-time drummer." 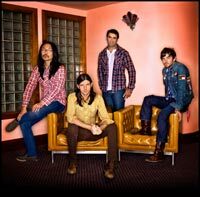 The growth of The Avett Brothers into a five-member band including Scott Avett on banjo, Seth Avett on guitar, Joe Kwon on cello and Jacob Edwards on drums contributed to the band's moving toward more electric music. Crawford said the band plays shows with equal amount of time to acoustic and electric music. "We are electrified," he said. "We embrace acoustic just as much as electric and in some ways we are having a renaissance playing acoustic." The band's sound is very roots oriented and Crawford said it is not bluegrass. "We really don't know what to call our music, but it's developed with punk and rock 'n' roll influences." The Avett Brothers embrace the music of Woody Guthrie and Doc Watson as much as the Beastie Boys. The band's timing for its performance at this year's Grammy Awards was a very powerful experience for them. They credit inspiration from T-Bone Burnett and Bob Dylan for making it possible. "When I think about the whole concept of our music and performing, I think of everyone who is playing in this new movement of roots music," he said. "Roots music is what we are doing. We have our challenges, which have made us flexible in the way we do things." Crawford said even that though they now have more mainstream acknowledgement, touring is of major importance. It's why they exist, he said, and 90 percent of their following has come from so much touring. Opening for The Avett Brothers is special guest Jessica Lee Mayfield, a 21-year-old singer whose voice is wise and soulful. Mayfield's first album, "Tell Me," was released by Nonesuch earlier this year. National Public Radio's "World Café" declared she has "a mature sound that seems evolved beyond her years," while The New York Times added that her sound is "guarded, insinuating, mesmerizing...music that lets you hear all its details."